Let's get technical! 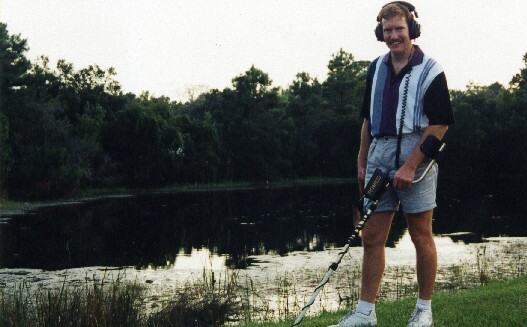 Several years ago, I had a 'seemingly' insignificant, yet unforgettable experience with my Fisher CZ-6a metal detector. My knowledge and learning curve of the detector was virtually complete at that point in time, as I had about 200 hours of operation with the detector. At a local school in Titusville, Florida I detected a weak, yet consistently repeatable coin signal from my detector. Before recovering the target, I thought this very deep coin signal would be a perfect opportunity to test every possible control panel set-up configuration of the detector. My learning curve was complete, finally! No adjustments to the control settings improved the signal to any greater extent. I then recovered the target. At less than 3" deep, I recovered a 1952 silver dime, face down. I was absolutely stunned on how weak the signal was. I instantly (and incorrectly) lost confidence in the detector's abilities. I placed the dime back into the 3" deep hole and passed the standard 8" coil over the silver dime. The detector nearly gave me an overload signal. That's more like it, I thought! I then put the grass plug back into the hole, covering the dime. Now the signal nearly disappeared again. Confused, I removed the grass plug and passed it over the coil. No signal. The plug was clean. Disappointed, I pocketed the dime, covered the hole and moved on. Less then one minute later, I received another identically weak signal. At 9.5" I recovered a worn 1928 mercury dime. It was less than 4 feet away from the first dime in the same type of low mineral soil conditions. Wow! What is this inconsistency? Two years pass, never forgetting this incident. In my feudal attempt to gain more knowledge about better detecting techniques - I discovered the answer, with startling results. In a professional test garden, I buried a tiny staple (slightly rusted) from a standard household stapler. This nearly weightless staple could be detected to a depth of 1.5". ((It is important to understand that the United States dime has become the national test standard for testing and comparing most general purpose detectors)). Now, having the knowledge of the detector's capabilities on this small staple, I decided to bury the staple 1 inch deep and directly over the top of a dime that was buried at 8.5" deep. (Keep in mind that Florida soil conditions are virtually mineral-free. Other States may have slightly varying results). As expected, the detector signaled 'iron'. The dime was 'masked' from detection, due to the staple. Removing the staple (leaving the dime), the detector then signaled "coin" with a fairly strong and consistent signal, even with the coil as high as 6" above the ground. Then I re-buried the staple 3" deep, over the same dime. Here is where the startling results begin. The detector was silent! The staple was too deep to give an audio response and the dime was completely masked (hidden) because of the staple. A case of "SILENT" masking. Then I buried the staple at 4", then 5", and then 6" deep (over the dime) and achieved identical results. Moving the staple away (off-center) from the dime by 4.5" I could then pick up the dime, but the detector would read the coin as a pull-tab and only signal in one direction. Passing the coil over the staple first, the detector remained silent. (Silent masking again). Replacing the ferrous staple with a non-ferrous lead BB from a BB air-rifle also produced identical results. Even when the detector was placed in the all-metal mode, the detector would give only a very slight chatter that just sounded like ground minerals. Is this a fault of the detector? Absolutely not! My White's 6000 Di Pro and Minelab Excalibur 800 equally failed. Here is what's happening: The electromagnetic energy from the coil punches into the ground and hits the staple producing an electromagnetic "halo" around the staple. The signal strength is dramatically reduced, and IF any energy does manage to make it down to the dime (very doubtful) - that signal must then return back to the coil - but will fail on the return path when it hits the staple "halo" again. (Metal detector coils operate under the principle of inductive coupling). When you discriminate iron with any detector (Minelab calls it "iron mask") you have achieved nearly nothing. (Simply, there will be no audio response reported in the headphones). The detectors electromagnetic signal is still disrupted by the iron. It does not matter if you transmit one frequency, two frequencies or 17 frequencies into the ground - electromagnetic energy is electromagnetic energy, and iron will always disrupt this energy. This is not a fault of any detector, only an indication of where technology is at today. There is not a detector on the market today that can "see through" iron. And I think I could safely say that less than 20 percent of the coins in the schoolyards and parks have been recovered because of masking, silent masking and deep depths. If a 8" coil can 'see' a one gallon volume of dirt and the 11" coil (not 10.5") can 'see' 7 gallons of dirt at any given time, it is a fact that you are 7 times more likely to 'mask' a object with the larger coil, especially in trashy areas. It is so easy to get into trouble with the larger coil AND NEVER KNOW IT! A true 'Double D' coil is a leap in technology and can separate targets better than the standard concentric coils; however, there are drawbacks. An 8" Double D coil will generate a signal (hypothetically) 8" long by 1" wide giving incredible adjacent target separation. As long as there is about an inch of distance between objects laterally, a true Double D coil will signal each target individually. Minelabs discontinued "CoinSearch" coil is a perfect example of a true Double D coil. The drawback is a decrease in overall detection depth. It is physically difficult to condense the electromagnetic energy into a narrow knife-like beam (directional field intensity) and achieve the same depth that a concentric coil attains. Still, no coil design can see through one metal object and reach the deeper target, then signal only on the deeper target. Why would the detector want to report the deeper, weaker target? When electromagnetic energy is used to locate metallic objects, masking is characteristically, an inherent flaw. This is where we stand today with our technological limitations. To further validate these characteristics of physics for the purpose of statistical analysis, I conducted one more experiment. I was honored when KELLYCO fulfilled my request to borrow $5000 in equipment for an experiment. KELLYCO allowed me to borrow a Minelab SD2200d detector and 3 coils, one of which was the huge 18" coil. I utilized this equipment extensively for 5 months. At an abandoned baseball diamond, I COMPLETELY sanitized the soil of all metal objects using my Fisher detector in the all-metal mode, and from 3 different directions. A fair amount of trash and 9 nice coins were found. Now, this baseball diamond was completely sanitized by the Fisher. The Excalibur also verified this status. Now it's time for the SD2200d to shine. Please understand that the SD is a pulse induction (PI) machine and is specifically designed for gold nugget (including tiny pinhead size) prospecting. It has extreme sensitivity and depth capabilities, however, inherent to pulse induction machines, discrimination is very poor. After 11 days of effort and a spinal column needing traction, I recovered an ADDITIONAL 1151 items. Regaining my sanity, I feel compelled to share this knowledge. Bear in mind, this is NOT my normal hunting habits. I found 4 tiny earrings, 2 gold rings, one silver ring, 2 silver pendants, 39 coins and over 1100 pieces of trash, all within the confines of the interior of a baseball diamond! Most of the trash consisted of steel and lead shot from shotgun shells - much smaller than the BB's used in a BB gun. Boot tacks, broken pieces of staples and tiny flakes of chewing gum foil were also common. Masking is unsuspectingly more prevalent then ever expected. Of the 39 additional coins recovered, most of them were well within (detectable) reach of the Fisher, but were masked. A few of the coins were deeper than the Fisher's capabilities. The SD2200d with its pulse induction will find many objects that would normally mask and silently mask other objects. By a large margin, the SD is the most powerful detector I have ever used; however, it is NOT designed for coin shooting. I strongly recommend against using this machine in an environment where discrimination is critical (most areas!). 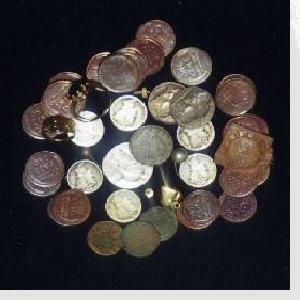 Nine (9) coins were found with the CZ. Thirty-nine (39) ADDITIONAL coins were (unmasked) found with special equipment. Forty-eight (48) coins in total. Looking at the ratio a bit differently; 9 of the 48 coins were detectable by a top-line coin detector. Thirtynine additional coins--- that's over 500 percent MORE coins,,,, were masked! Yes, unsuspectingly, this is THE norm! Are there remaining items (including coins) in the baseball diamond that all three detectors missed? ABSOLUTELY! Awaiting future technology!